In 1760 George Washington recorded the receipt of an invoice dated December 26th, detailing his latest purchases from London. Therein he listed "A pair 3 dropt Garnet Earings" bought from a jeweler named J. Grymes to grace the ears of his wife, Martha. 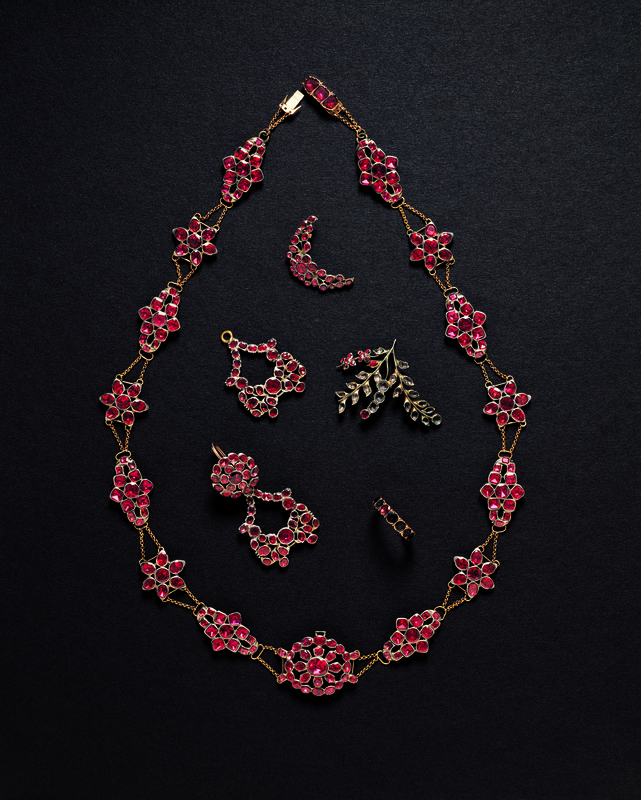 Martha Washington was no stranger to garnet jewelry, having received a necklace and hair ornament the year before. In the eighteenth century, "dropt" earrings referred to earrings with removable dangling pendants. Prized for their versatility and elegance, the earrings could be changed to accommodate the occasion for which they were worn. E1: Drop pendant made from seventeen almandite garnets set in gold-washed silver. The removable ornament is suspended from an integrated loop mounted at the join of a double swag of nine garnets. Attached by a single gem at the terminus of each swag is a bow knot made of eighteen stones. Beneath the center of the knot is a horizontally mounted bar made to receive the third drop. Each gem is backed with foil in a closed setting. E2: Drop pendant made from seventeen almandite garnets set in gold-washed silver. The removable ornament is suspended from an integrated loop mounted at the join of a double swag of nine garnets. Attached by a single gem at the terminus of each swag is a bow knot made of eighteen stones. Beneath the center of the knot is a horizontally mounted bar made to receive the third drop. Each gem is backed with foil in a closed setting. 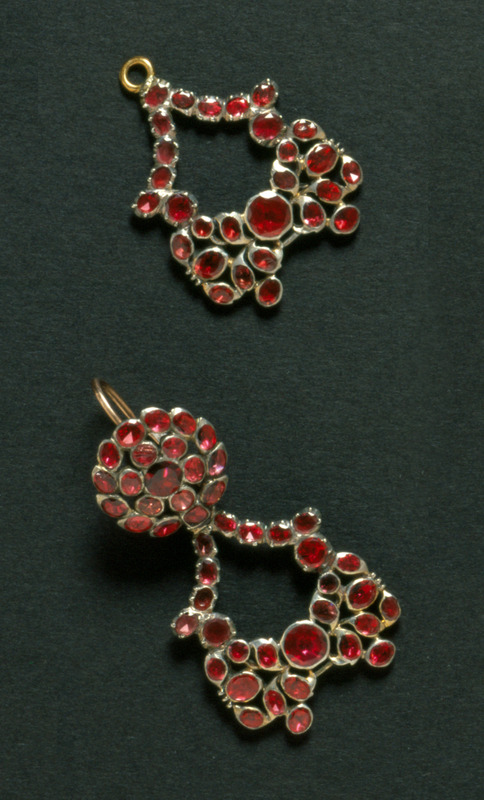 E3: Earring made from nineteen almandite garnets set in gold-washed silver. The earring is adorned with a seven stone flower cluster surrounded by a wreath of twelve gems attached to an open ring-lever back ear wire. Each gem is backed with foil in a closed setting.